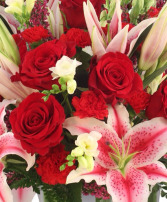 Prospect Florist Delivers Amazing Designs over 25 Years ~Greater Waterbury Area! 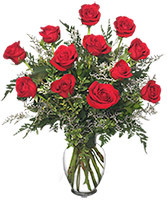 One dozen long stem, amazing red roses arranged in a lovely vase. 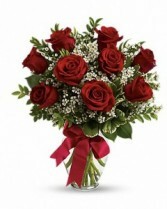 Our roses are grade A, top quality, florist grade roses ~ truly beautiful. This design is the perfect statement of love. Price #2 includes added fillers ~ gorgeous. 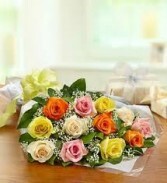 Beautiful assorted pastel colored roses delivered in a lovely presentation bouquet! Or select shop pick up at check out and pick them up at our shop! Colors will vary from picture, but you will be sure to love them! Price #1 does not include fillers ONLY AVAILABLE IN THE TOWNS THAT MARGOT'S DELIVERS TO. 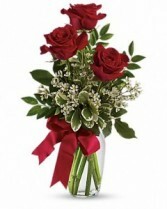 Lovely Bud Vase with 3 beautiful roses and fillers! Our most beautiful assorted flowers ~ are designed in a lovely vase of water, 2 larger sizes include roses in the design, sure to impress your loved one! Delivered to their door or select "shop pick up" at check out and we will have your order ready for a shop pick up! 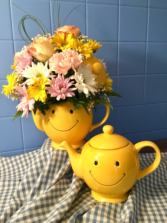 Assorted flowers are designed in this adorable, completely usable teapot. Sure to bring a smile to the recipient! Only available from Margot’s, we hand deliver to our 10 surrounding towns. 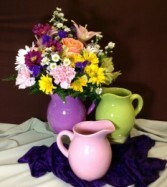 Our ceramic water/milk pitcher is filled with a lovely assortment of bright and colorful flowers. Larger size includes roses. Wonderful keepsake container. MIXED ASSORTED SEASONAL FLOWERS "A"
Assorted, colorful and beautiful seasonal flowers delivered in a lovely presentation bouquet. (Or order to be picked up at our shop). Flowers will reflect the season and be our very best. NOT AVAILABLE FOR OUT OF MARGOT'S DELIVERY TOWNS. MIXED ASSORTED SEASONAL FLOWERS "B"
Larger bouquet of our finest assorted, colorful, seasonal flowers delivered in a lovely presentation bouquet. (Or order to have ready for a shop pick up).NOT AVAILABLE FOR OUT OF MARGOT'S DELIVERY TOWNS. 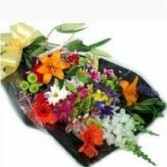 WE DO deliver on Sundays and Mondays to all funeral homes.